It was still quite dark out when we were awakened on April 3, our departure day from Camp Shawu. We had originally been scheduled for a morning game drive before leaving for the airport, but the night before there were several calls from the main lodge giving mixed signals. When we went to bed we were told there would be a truncated one hour game drive before departure, but 3 of our group decided not to go. Now we were told that our game drive would take us to the main lodge and the other 3 would be brought in a second car with all of our luggage. But in the end we were told that there would be no game drive at all and all seven of us would be driven directly to the main lodge. Such confusion (not to mention irritation). We had, of course, gotten up well before dawn each morning at the camp but this was the first morning in which we were still there to see the sun rise over the lake. It was really worth seeing. As the sun rose above the mountains we went out on the veranda for some final pictures before departure. We noticed that the trees at the end of the lake were filled with egrets at first light, probably from fear of crocodiles (or maybe just fear of the dark). 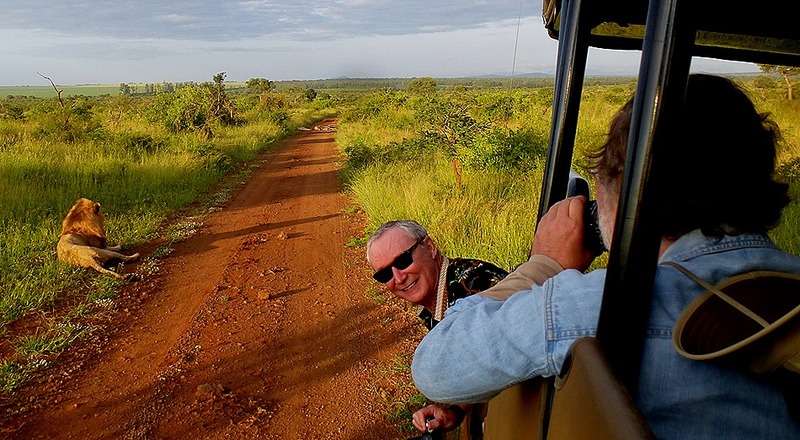 After all the mixed signals about the morning’s activities it was finally decided by the folks at the main lodge that we would have to skip even the truncated game drive and come there right away. This was a disappointment to those of us planning to go on the game drive, but we all climbed into the safari vehicle and Safiso headed out to the road to the main lodge. But we hadn’t gone more than 5 or 10 minutes before we were stopped by a group of four male lions stretched out across the road. We had heard them howling during the night & Safiso said they were probably feeling lazy because they had enjoyed a good meal. They looked quite beautiful, sometimes almost glowing in the early morning sun. These guys were seriously relaxed & couldn’t have cared less about our being there. It must be good to be at the very top of the food chain and not have to be afraid of anyone else. After we had been there a little while most of them lay down & went to sleep. Safiso had sent out a call to other safari vehicles about the lion spotting. We couldn’t do anything to rouse the lions before the others had a chance to get there and it was a much longer drive if we turned around and went a different way. Eventually a number of other vehicles showed up, most on the other side of the lions. None of this disturbed them however. Before we left the ship Rick had been claiming that he would take a picture of Robert with a lion on the safari. So while we waited he did so! Not what we might have hoped, since the lion wasn’t close and wouldn’t look in our direction. But a picture of Robert and the lion it is, just as promised. By the way, take a look at the zoomed shot of the lion in the fourth picture below. He appears to have one dark blue and one yellow eye. Just like Washington Nats’ ace Max Scherzer! I wonder if he can pitch? This condition is called Heterochromia Iridum. Just when Safiso was about to turn around and take the long road to the main lodge for fear of missing our flight the lions grudgingly stood up and walked into the grass to the left of the road. They lay there in the tall grass, some watching us and some not, while we finally were finally able to continue our journey. We made it back without further incident to the main lodge where we were given a sumptuous buffet breakfast. Then we headed out to the airport in buses that were not quite as uncomfortable as the ones that brought us from Maputo. It was a pretty long drive & we did see a number of animals but the bus was too bouncy and the windows too small to get decent pictures for the most part. 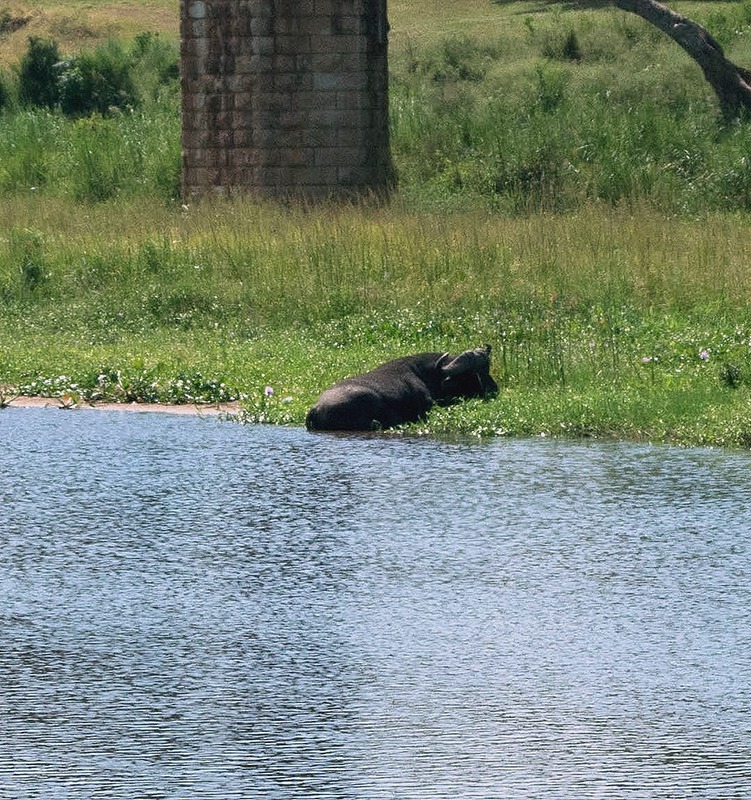 When we crossed the river there was a Cape Buffalo lounging on the shore, the only one we had seen with its face turned toward us. It was on the other side of the bus so we couldn’t get a picture, but our friend Mike shared one with us. One more thing before we leave Kruger National Park. Here are some of the flowers we saw during our stay, some in the wild and some at the lodges. Actually, there were surprisingly few actual blooms considering all the bush area we passed through. The flight to Cape Town was uneventful. Unfortunately we were seated on the aisle next to a wing, so we were unable to see anything of the South African countryside during the flight. Not a typo . . . we were both on the aisle, one in front of the other, and we were not the only couple separated like that. We have never experienced anything like that on an airline before. There was a meal served, but it was cold (like just out of the refrigerator). This wouldn’t have been so bad if it had been a sandwich, but Rick’s meal was meat and noodles, cold and clammy. If you know Rick you will not be surprised that he ate it anyway. We made it back to the ship in late afternoon, but we were pretty tired so we didn’t go anywhere. It turned out that when the ship arrived in Cape Town that morning a cargo ship that had been there a few days was docked overlapping Amsterdam’s docking location by a few feet. So Amsterdam had to sail around in circles for a few hours before its berth was cleared for docking. The Captain was beside himself & declared that he had never seen anything like it in his long career at sea. After dinner we went up to deck 6 to see Cape Town at night. It was well lit and made for some nice pictures. Tomorrow we would venture out and see what is there.